I just finished an exciting read: Schweiger & Beierkuhnlein’s study on how well temperature predicts distribution of 19 vascular plants across 3 spatial scales (ranging from ~<1 m to 1000s of km). Overall they find regardless of the scale the same optimum temperature is observed (weak scale dependence). Nonetheless, they also find that the maximum probability of occurrence increases with grain size (strong scale dependence), which they interpret to mean that temperature is a more important driver of distribution at coarse scales. Cool stuff! I’ve been specifically wondering about this for a while, and this seems to be the first test thereof. But what does it really mean? First, I should say that their analysis was based on extracting metrics from the modeled response curves, not the response curves per se–and to my eye the curves for any particular species seem very different across scales even after correcting for differences in height (their Figs. 1 and S1). I would have liked to see a statistical comparison of the shapes of curves. But let’s let that lie and think about what they found. In a nutshell, their results are predicted by the Eltonian noise hypothesis which posits that abiotic drivers like temperature will be more important at coarse scales while biotic drivers will create “noise” in distribution at fine scales–noise that will be generally imperceptible at coarse scales. They infer this from the fact that maximum probability of presence increases with coarseness of grain (i.e., when predicting presence at fine grains the maximum probability will be low). Ergo, temperature is a stronger predictor of presence at coarse scales. We can see that except at the extreme cases of p1 = p2 = 0 and 1, coarse-scale probability of occurrence is always higher than fine-scale probability of occurrence.  So the relevant question is “Does the increased probability of occurrence at coarse scales exceed what we’d expect by chance given that the coarse domain is composed of fine domains?” If so, only then can we say that temperature is a more important determinant of distribution at coarse scales. And that is what I would take as verification of this particular prediction of the Eltonian noise hypothesis.